Here are photos that I've taken on various trips for Cheap Trick shows (with the exception of a couple of pages of pictures kindly provided by friends). You'll find thumbnails of pictures of the band, and pictures of many of their fans ! PLEASE NOTE that most shots are of the fans, not the band. 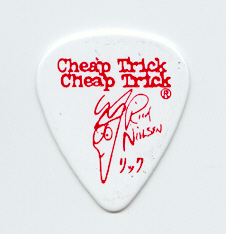 But there ARE some shot's of Cheap Trick ! I have assumed permission to post shots of the fans, but if you're pictured and don't wish to be, please contact me by e-mail at kgisborne@aol.com. Gallery #1 contains shots from Trickfest 1 through to California 6/99. Gallery #2 contains shots from Trickfest 3 and Japan. Gallery #3 contains shots from the Dallas show on 4 Oct 99 (courtesy of Kim F), the Orlando, March 2000 show (courtesy of Kelley D) and some of my CT/fan photo's from March through Aug 2000. Gallery #4 contains shots from New Years Eve 2000 to May 2002. Gallery #5 contains shots from California in July 2002 onwards. PLUS... there's a page of some setlists, tickets etc I've collected from various shows, a new gallery of pix of one or two other bands I've seen recently, and a *new* page of Cheap Trick memorabilia at Hard Rock Cafe's around the world! I hope you enjoy them all !